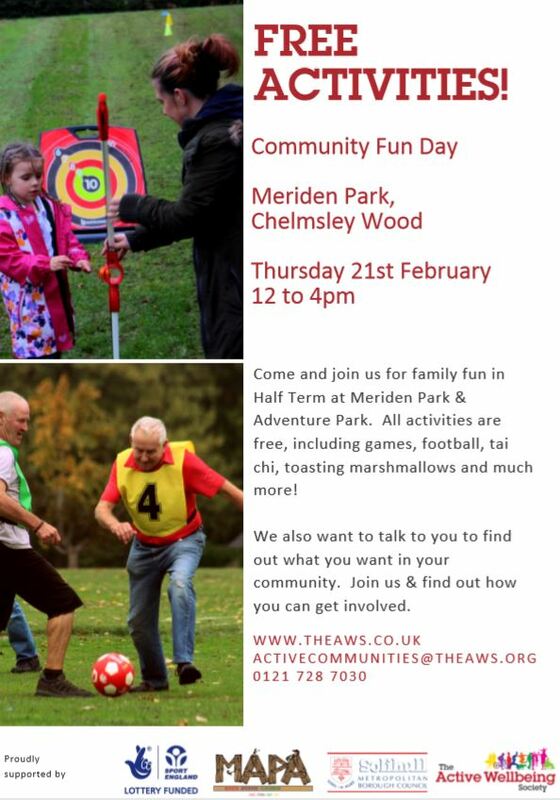 The fun begins at 12pm on Thursday 21st February at Meriden Park. Activities will be in the Adenture Park and across Meriden Park to include bikes, running, sports, games and toasting marsh mallows over a fire. Active Parks will be working with Inclusive Sports to provide a range of games and sports from 12pm to 4pm. Our bike team biking across the park. We will have some to lend, but please bring your own bike if you can. There will be football all day and Birmingham City Football Community Trust will be there for one-on-one football from 1pm. At around 1pm a local run group organised through Active Communities will be joining us in the Park, and there will be an opportunity to try Tai Chi with our instructors between 1 and 3pm. At 3pm a fire will be lit in the Adventure Park to toast marsh mallows and have a hot chocolate with our Active Streets Team. Active Communities wants to talk to people to find out more about what it takes to get more people active locally – as part of the event we will be talking to everyone to find out more and to work out the best way to support Active communities locally.